An awe-inspiring landscape made of countless oddly-shaped rocks and precipitous cliffs: That is what is left of an ancient volcano after a long period of erosion. Now only the tough skirts of the volcano remain, creating a range of many bizarrely-shaped peaks that are now recognised as three separate mountains; Mt. Hakuun (白雲山: Hakuun-san), Mt. Kondo (金洞山: Kondo-zan), Mt. 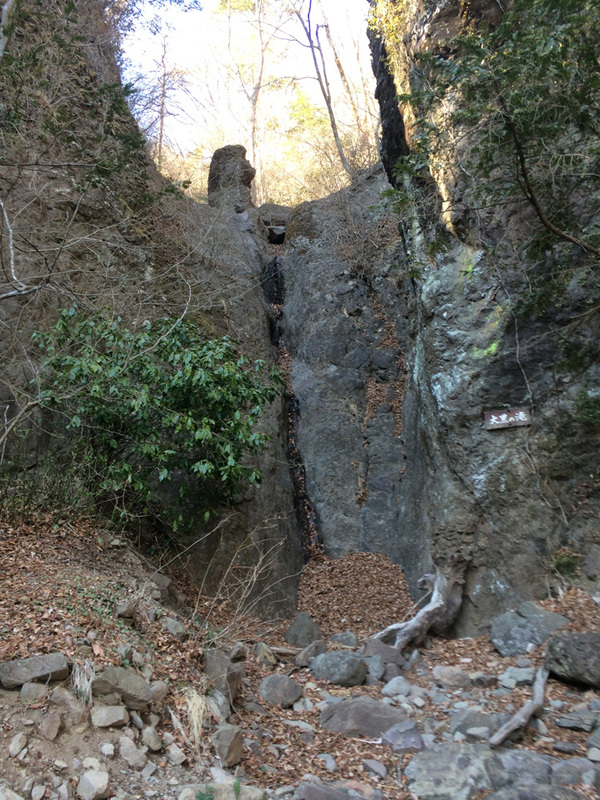 Kinkei (金鶏山: Kinkei-zan). Collectively they are known as Mt. Myogi (妙義山: Myogi-san), suggesting that its look is “peculiarly unique”. Since ancient times, Mt. Myogi has always been the subject of worship by locals, and in times of provincial wars the warrior class invoked its guardianship to aid their victory in battles. Successive shoguns (the military dictators of Japan) as well as daimyo (feudal lords) of various regions in Japan revered Mt. Myogi, and during the Edo Period (1603-1868) it flourished as a place of significance, where the highest-ranking monk of Toeizan Kan’ei-ji Temple in Edo (present-day Tokyo), Rinnoujimiya (輪王寺宮), retired and withdrew himself to. The temple there was dubbed the “imperial palatial home”. The very foundation of all these people’s worship should come from the mountain’s contours, which inspire us to see and feel the origin and the energy of this planet we live on, as well as the remnants of the Jomon Era (10,500-300 B.C. ), the people of which lived there as a hunter-gatherer community. Because Mt. Myogi has been worshipped through the ages, its environment shows vivid traces of Japan’s spiritual/religious history, between Shinto and Buddhism, significantly impacted by the politics of the times. 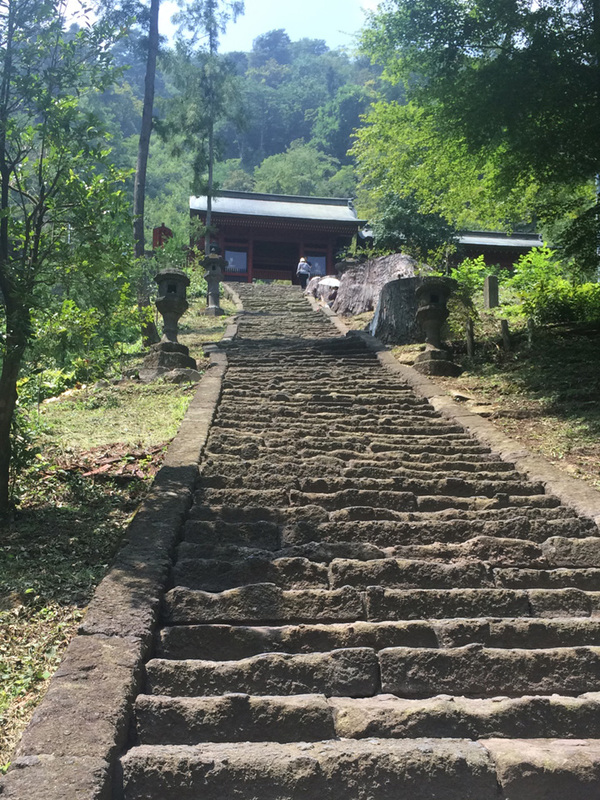 Standing at the foot of the mountain is the Myogi “shrine”, but the very first gate welcoming visitors to the shrine is a Buddhist temple gate. A wanderer will find many Buddhist stupas in the mountains. 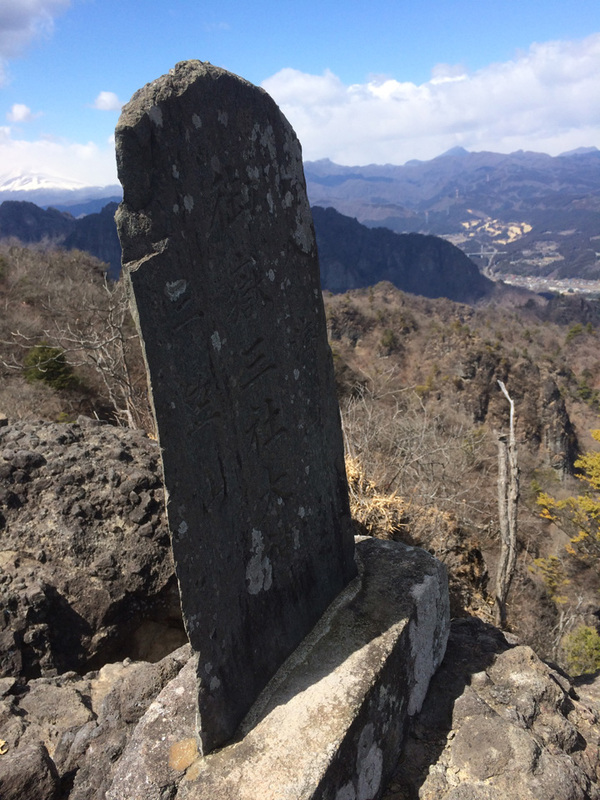 Another such reminder of the syncretism of Shinto and Buddhism, which lasted more than 1,000 years up to the Meiji Era, is the name of the inner sanctuary found high up in the mountain. In a Shinto context, such a place is normally called “okumiya (奥宮)”, but this shrine’s sanctum is called “oku-no-in (奥の院)”, the typical Buddhism name for it. At some point in its history the inner sanctuary did indeed enshrine a Buddhist deity, Dainichi Nyorai (大日如来), the central deity of Esoteric Buddhism. Above Myogi shrine, halfway up Mt. Hakuun, there is a huge white object in the shape of the Japanese character “大”, which means “large”, the first character in the name Dainichi Nyorai. It is interesting to wonder whether this comes from Buddhism’s influence or Shinto’s, because the same character is also used in the name of the Shinto deity Myogi Daigongen (妙義大権現). Dainichi Nyorai (大日如来) is a purely Buddhist deity, but Daigongen (大権現) is the product of syncretism of Shinto and Buddhism. Such syncretism resulted in the religion of Shugendo (修験道), whose mountain-living shugenjas (修験者) practiced asceticism incorporating Shinto and Buddhist concepts until the time the government separated Shinto and Buddhism in the Meiji Era (1848). As shugenjas are sometimes depicted as tengu, supernatural legendary beings found in mountains, Mt. Myogi also began to be known as “the holy mountain of tengus”. The Meiji Era movement to separate Shinto and Buddhism included many acts of Haibutsu-kishaku (廃仏毀釈), acts against Buddhism. Many Buddhist stupas and pagodas on Mt. Myogi were destroyed. 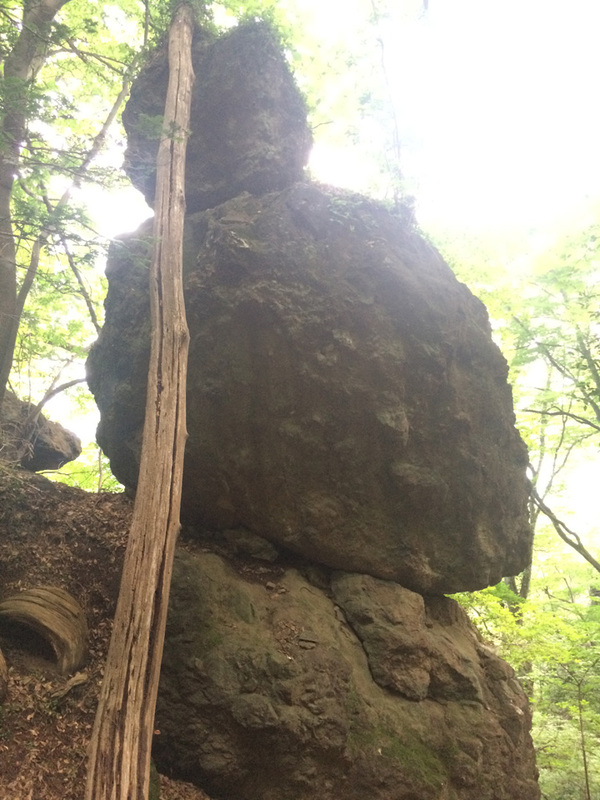 If you were to go to the Oku-no-in (inner sanctuary) near the top of Mt. Hakuun, you would find fragments of the lotus-shaped base where the stone figure of Dainichi Nyorai, the Buddhist deity, once sat. Everywhere in the world, people’s lives are subject to change under the influence of the changing times. Mt. Myogi is one place where you can see how Japanese people’s faith and beliefs were subject to social and political changes over the history. Another interesting aspect of Myogi shrine is that it has a religious structure known as “Hakoso-sha (波古曾社)” in its premises. This structure is proof of the locals’ continuous worshipping of the outlandish sequence of mountains since ancient times, as shown in the shrine’s paleographical record. 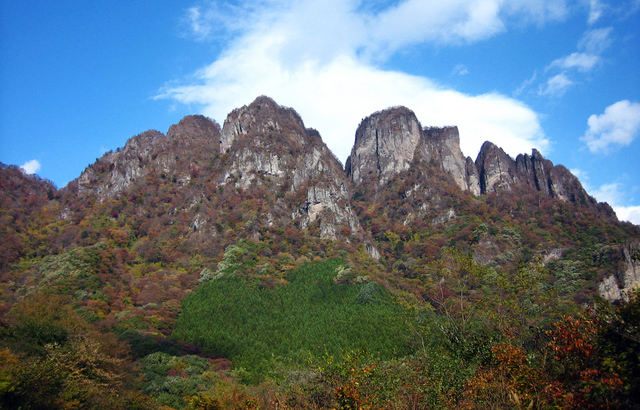 The first syllable, “ha”, was probably a shortening of “Iwa”, which means “rock” in description of the shape of the mountain. The second and the third syllables, “koso”, mean “spiritual building” in ancient Korean. This infers that a spiritual connection between the Japan archipelago and the Asian mainland existed a long time ago. 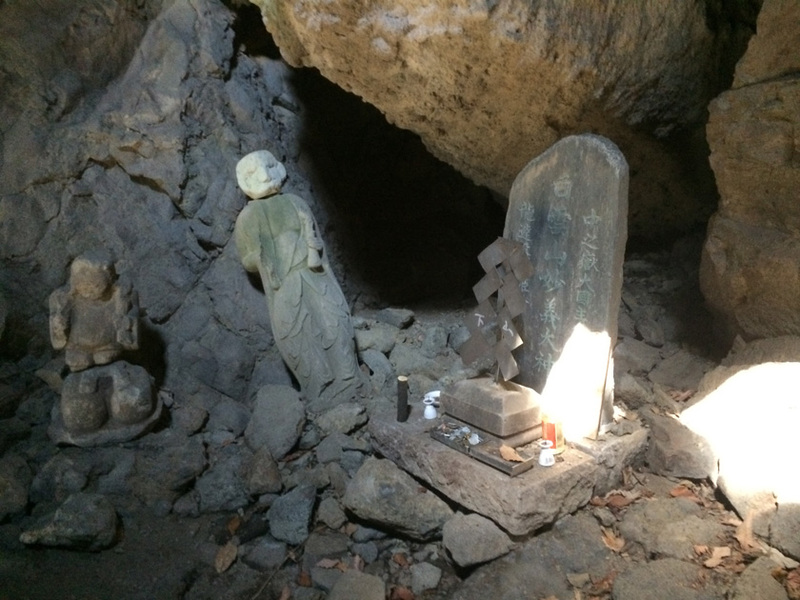 In modern language, “Hakoso-sha” can be translated as “rock shrine”. People in the old days sometimes enshrined rock, a part of nature itself, as a deity for worship. Give more than a passing thought to the indigenous, long-standing spiritual beliefs and you will find the worshipping of nature beyond the various deities with specific name and stories. Since the beginning of the modern climbing era, Mt. Myogi has long been known as having a world-top-class high yearly casualty/deathly accident rate, partly because the challenging shapes of the mountains attract many rock-climbing lovers and there are many slip and fall accidents. There will always be risk when the lure of conquering peaks and cliffs is too much for human capability. This always reminds me to clarify the stance I should have when going into the mountains. There is no such a thing as a safe mountain. Death climbs mountains right beside you, and becoming fully conscious of death fully wakes your often-dormant sensation of being alive. Voluntarily going for a mountain climb is almost like stepping towards the land of the dead. While experiencing unconscious and conscious fear, one pays full attention to every move. There, feel the strong sense of awe towards mighty nature and you will think of nothing but getting home safely. In Japanese, the word “to resurrect” is pronounced “yomigaeru”, and this sound’s almost exactly the same as “yomikaeru”, “to come home from the dead of the land”. The development of the word also, in my opinion, showcases how Japanese people have always held mountains in their spiritual lives.